Recently, we posted a blog explaining that the Ozark Mountains are actually incised plateaus and that the hills are remnants standing between the incised river valleys. If you missed that one you can see it here. Now, we will talk about how a river is able to erode solid rock. 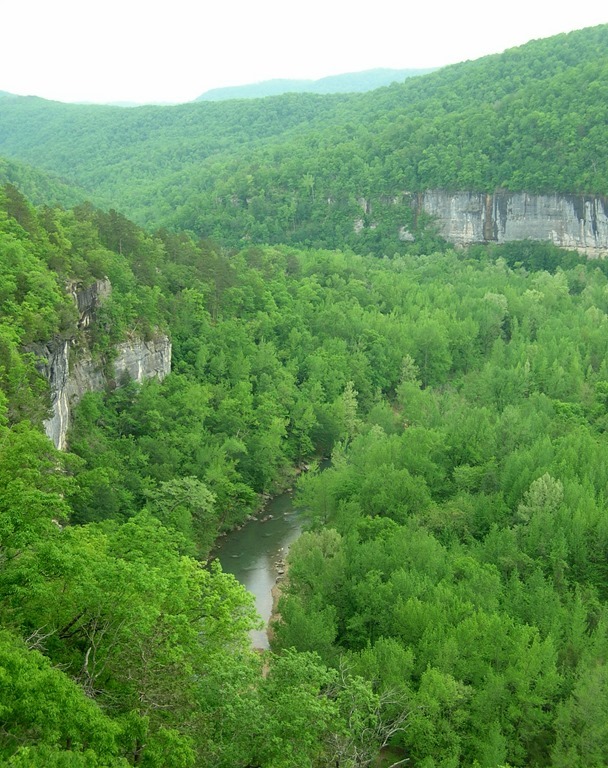 The picture above is of the Buffalo National River in its valley. As you can see, an impressive volume of rock has been excavated by this little river. A common misconception is that the water is carving the rock. Water is soft and softer things generally do not abrade harder things. Slightly acidic water can dissolve rock very slowly, particularly carbonate rock like limestone, However, the majority of the erosion in a river is due to the sediment suspended in the flowing water. As the sediment – which can range from tiny grains of silt to boulders– is carried downstream by the current, it skips along the channel, colliding with the bedrock. The repeated collisions break down the sediment, chipping off edges and rounding it. By the same process, new sediment is ground away from the bedrock and the valley is slowly enlarged. The same thing is true of wind erosion such as in a desert setting. The wind itself really can’t erode the rock. The erosion is due to strong winds lifting loose sand and blasting it against the solid rock, slowly wearing it away. This entry was posted in #geoblog, GeoPic of the Week and tagged Arkansas, Buffalo National River, erosion, Fluvial, Geology, Ozark Mountains, Ozark Plateaus, Processes, River Valley, Weathering on April 17, 2018 by argeology.